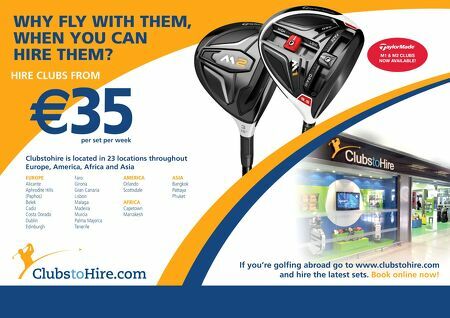 M1 & M2 CLUBS NOW AVAILABLE! WHY FLY WITH THEM, WHEN YOU CAN HIRE THEM? HIRE CLUBS FROM EUROPE Alicante Aphrodite Hills (Paphos) Belek Cadiz Costa Dorada Dublin Edinburgh Faro Girona Gran Canaria Lisbon Malaga Madeira Murcia Palma Majorca Tenerife AMERICA Orlando Scottsdale AFRICA Capetown Marrakesh ASIA Bangkok Pattaya Phuket €35 per set per week Clubstohire is located in 23 locations throughout Europe, America, Africa and Asia If you're golfing abroad go to www.clubstohire.com and hire the latest sets. Book online now!